the title of this week's post may look like a bit of a typo but it's not, in fact I'm very excited about this. Let me explain ... more than that, let's take a couple of steps back for my non-Australian readers so you know what I'm talking about. 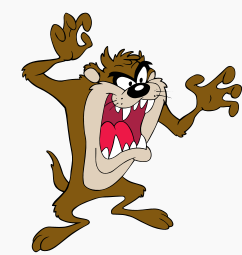 This chap is Taz, the Looney Tunes character. You may not realise that this growling, gurgling whirlwind is based on a real life animal; a unique carnivorous marsupial native to Tasmania, the Tasmanian Devil. This here is the real thing - a magnificent, intelligent animal. 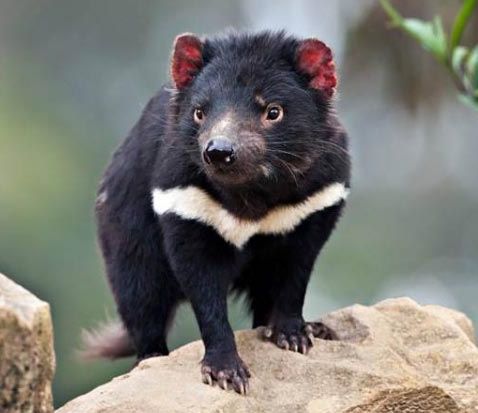 In the wild, Tasmanian Devils are decreasing in numbers due to a nasty facial tumour - I won't show you pictures of that - it's truly horrifying and the poor creatures suffer terribly because of it. But Autralian scientists are working hard to find a cure - it's a race against time to help save a species that could well become extinct in our life time! So what has this got to do with writing? Glad you asked. I have stumbled across a short story writing competition where the money raised is going towards the Save the Tasmanian Devil Program Appeal. A very worthy cause. The prize money is a whopping $10,000 but there is a catch - of course. Your main character must be an accountant! That's right - an accountant! Why? Well because the mob running the competition is a taxation firm called Success Tax Professionals. They're putting up the prize money as well as making a hefty donation to the cause. I haven't checked out all the details of this competition but from what I can see it looks great. It's called the Twisted Tax Tales competition and entries are accepted from 1 March 2016. Now a tip - I never really took myself seriously as a writer, but one day, simply out of boredom, I wrote a short story and guess what!? I won first prize. Not only that, but I suddenly found incentive to quit a boring job and become a full time writer. You just never know, right! So the moral of the story is, just give it a go. Who knows, you just may be a lot more talented than you think. You will be supporting a great claws ... (get it!!) and the top 20 stories will be published in a book so you might even end up calling yourself a published writer.